Hemoglobin (American) or haemoglobin (British) (/ˈhiːməˌɡloʊbɪn, ˈhɛ-, -moʊ-/), abbreviated Hb or Hgb, is the iron-containing oxygen-transport metalloprotein in the red blood cells (erythrocytes) of almost all vertebrates (the exception being the fish family Channichthyidae) as well as the tissues of some invertebrates. Haemoglobin in the blood carries oxygen from the lungs or gills to the rest of the body (i.e. the tissues). There it releases the oxygen to permit aerobic respiration to provide energy to power the functions of the organism in the process called metabolism. A healthy individual has 12 to 16 grams of haemoglobin in every 100 ml of blood. In mammals, the protein makes up about 96% of the red blood cells' dry content (by weight), and around 35% of the total content (including water). Haemoglobin has an oxygen-binding capacity of 1.34 mL O2 per gram, which increases the total blood oxygen capacity seventy-fold compared to dissolved oxygen in blood. The mammalian hemoglobin molecule can bind (carry) up to four oxygen molecules. Hemoglobin is involved in the transport of other gases: It carries some of the body's respiratory carbon dioxide (about 20–25% of the total) as carbaminohemoglobin, in which CO2 is bound to the heme protein. The molecule also carries the important regulatory molecule nitric oxide bound to a globin protein thiol group, releasing it at the same time as oxygen. Haemoglobin is also found outside red blood cells and their progenitor lines. Other cells that contain haemoglobin include the A9 dopaminergic neurons in the substantia nigra, macrophages, alveolar cells, lungs, retinal pigment epithelium, hepatocytes, mesangial cells in the kidney, endometrial cells, cervical cells and vaginal epithelial cells. In these tissues, haemoglobin has a non-oxygen-carrying function as an antioxidant and a regulator of iron metabolism. Haemoglobin and haemoglobin-like molecules are also found in many invertebrates, fungi, and plants. In these organisms, haemoglobins may carry oxygen, or they may act to transport and regulate other small molecules and ions such as carbon dioxide, nitric oxide, hydrogen sulfide and sulfide. A variant of the molecule, called leghaemoglobin, is used to scavenge oxygen away from anaerobic systems, such as the nitrogen-fixing nodules of leguminous plants, before the oxygen can poison (deactivate) the system. In 1825 J. F. Engelhard discovered that the ratio of iron to protein is identical in the hemoglobins of several species. From the known atomic mass of iron he calculated the molecular mass of hemoglobin to n × 16000 (n = number of iron atoms per hemoglobin, now known to be 4), the first determination of a protein's molecular mass. This "hasty conclusion" drew a lot of ridicule at the time from scientists who could not believe that any molecule could be that big. Gilbert Smithson Adair confirmed Engelhard's results in 1925 by measuring the osmotic pressure of hemoglobin solutions. The oxygen-carrying property of hemoglobin was discovered by Hünefeld in 1840. In 1851, German physiologist Otto Funke published a series of articles in which he described growing hemoglobin crystals by successively diluting red blood cells with a solvent such as pure water, alcohol or ether, followed by slow evaporation of the solvent from the resulting protein solution. Hemoglobin's reversible oxygenation was described a few years later by Felix Hoppe-Seyler. 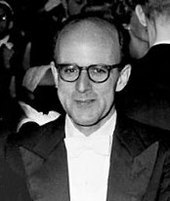 In 1959, Max Perutz determined the molecular structure of hemoglobin by X-ray crystallography. This work resulted in his sharing with John Kendrew the 1962 Nobel Prize in Chemistry for their studies of the structures of globular proteins. Variations in hemoglobin amino acid sequences, as with other proteins, may be adaptive. For example, hemoglobin has been found to adapt in different ways to high altitudes. Organisms living at high elevations experience lower partial pressures of oxygen compared to those at sea level. This presents a challenge to the organisms that inhabit such environments because hemoglobin, which normally binds oxygen at high partial pressures of oxygen, must be able to bind oxygen when it is present at a lower pressure. Different organisms have adapted to such a challenge. For example, recent studies have suggested genetic variants in deer mice that help explain how deer mice that live in the mountains are able to survive in the thin air that accompanies high altitudes. A researcher from the University of Nebraska-Lincoln found mutations in four different genes that can account for differences between deer mice that live in lowland prairies versus the mountains. After examining wild mice captured from both highlands and lowlands, it was found that: the genes of the two breeds are "virtually identical—except for those that govern the oxygen-carrying capacity of their hemoglobin". "The genetic difference enables highland mice to make more efficient use of their oxygen", since less is available at higher altitudes, such as those in the mountains. Mammoth hemoglobin featured mutations that allowed for oxygen delivery at lower temperatures, thus enabling mammoths to migrate to higher latitudes during the Pleistocene. This was also found in hummingbirds that inhabit the Andes. Hummingbirds already expend a lot of energy and thus have high oxygen demands and yet Andean hummingbirds have been found to thrive in high altitudes. Non-synonymous mutations in the hemoglobin gene of multiple species living at high elevations (Oreotrochilus, A. castelnaudii, C. violifer, P. gigas, and A. viridicuada) have caused the protein to have less of an affinity for inositol hexaphosphate (IHP), a molecule found in birds that has a similar role as 2,3-BPG in humans; this results in the ability to bind oxygen in lower partial pressures. Birds' unique circulatory lungs also promote efficient use of oxygen at low partial pressures of O2. These two adaptations reinforce each other and account for birds' remarkable high-altitude performance. Hemoglobin adaptation extends to humans, as well. Studies have found that a small number of native Tibetan women have a genotype which codes for hemoglobin to be more highly saturated with oxygen. Natural selection seems to be the main force working on this gene because the mortality rate of offspring is significantly lower for women with higher hemoglobin-oxygen affinity when compared to the mortality rate of offspring from women with low hemoglobin-oxygen affinity. While the exact genotype and mechanism by which this occurs is not yet clear, selection is acting on these women's ability to bind oxygen in low partial pressures, which overall allows them to better sustain crucial metabolic processes. 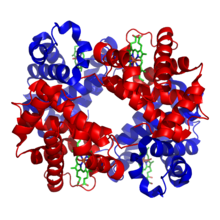 Hemoglobin has a quaternary structure characteristic of many multi-subunit globular proteins. Most of the amino acids in hemoglobin form alpha helices, and these helices are connected by short non-helical segments. Hydrogen bonds stabilize the helical sections inside this protein, causing attractions within the molecule, which then causes each polypeptide chain to fold into a specific shape. Hemoglobin's quaternary structure comes from its four subunits in roughly a tetrahedral arrangement. In most vertebrates, the hemoglobin molecule is an assembly of four globular protein subunits. Each subunit is composed of a protein chain tightly associated with a non-protein prosthetic heme group. Each protein chain arranges into a set of alpha-helix structural segments connected together in a globin fold arrangement. Such a name is given because this arrangement is the same folding motif used in other heme/globin proteins such as myoglobin. This folding pattern contains a pocket that strongly binds the heme group. Deoxygenated hemoglobin is paramagnetic; it is weakly attracted to magnetic fields. In contrast, oxygenated hemoglobin exhibits diamagnetism, a weak repulsion from a magnetic field. Most ice fish of the family Channichthyidae have lost their hemoglobin genes as an adaptation to cold water. X-ray photoelectron spectroscopy suggests iron has an oxidation state of approximately 3.2. A schematic visual model of oxygen-binding process, showing all four monomers and hemes, and protein chains only as diagrammatic coils, to facilitate visualization into the molecule. Oxygen is not shown in this model, but, for each of the iron atoms, it binds to the iron (red sphere) in the flat heme. For example, in the upper-left of the four hemes shown, oxygen binds at the left of the iron atom shown in the upper-left of diagram. This causes the iron atom to move backward into the heme that holds it (the iron moves upward as it binds oxygen, in this illustration), tugging the histidine residue (modeled as a red pentagon on the right of the iron) closer, as it does. This, in turn, pulls on the protein chain holding the histidine. As oxygen binds to one monomer of hemoglobin, the tetramer's conformation shifts from the T (tense) state to the R (relaxed) state. This shift promotes the binding of oxygen to the remaining three monomer's heme groups, thus saturating the hemoglobin molecule with oxygen. In the tetrameric form of normal adult hemoglobin, the binding of oxygen is, thus, a cooperative process. The binding affinity of hemoglobin for oxygen is increased by the oxygen saturation of the molecule, with the first molecules of oxygen bound influencing the shape of the binding sites for the next ones, in a way favorable for binding. This positive cooperative binding is achieved through steric conformational changes of the hemoglobin protein complex as discussed above; i.e., when one subunit protein in hemoglobin becomes oxygenated, a conformational or structural change in the whole complex is initiated, causing the other subunits to gain an increased affinity for oxygen. 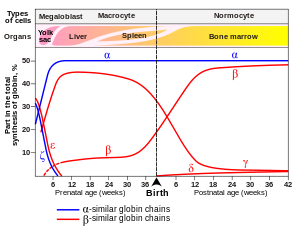 As a consequence, the oxygen binding curve of hemoglobin is sigmoidal, or S-shaped, as opposed to the normal hyperbolic curve associated with noncooperative binding. Besides the oxygen ligand, which binds to hemoglobin in a cooperative manner, hemoglobin ligands also include competitive inhibitors such as carbon monoxide (CO) and allosteric ligands such as carbon dioxide (CO2) and nitric oxide (NO). The carbon dioxide is bound to amino groups of the globin proteins to form carbaminohemoglobin; this mechanism is thought to account for about 10% of carbon dioxide transport in mammals. Nitric oxide can also be transported by hemoglobin; it is bound to specific thiol groups in the globin protein to form an S-nitrosothiol, which dissociates into free nitric oxide and thiol again, as the hemoglobin releases oxygen from its heme site. This nitric oxide transport to peripheral tissues is hypothesized to assist oxygen transport in tissues, by releasing vasodilatory nitric oxide to tissues in which oxygen levels are low. The binding of oxygen is affected by molecules such as carbon monoxide (for example, from tobacco smoking, exhaust gas, and incomplete combustion in furnaces). CO competes with oxygen at the heme binding site. Hemoglobin's binding affinity for CO is 250 times greater than its affinity for oxygen, meaning that small amounts of CO dramatically reduce hemoglobin's ability to transport oxygen. Since carbon monoxide is a colorless, odorless and tasteless gas, and poses a potentially fatal threat, carbon monoxide detectors have become commercially available to warn of dangerous levels in residences. When hemoglobin combines with CO, it forms a very bright red compound called carboxyhemoglobin, which may cause the skin of CO poisoning victims to appear pink in death, instead of white or blue. When inspired air contains CO levels as low as 0.02%, headache and nausea occur; if the CO concentration is increased to 0.1%, unconsciousness will follow. In heavy smokers, up to 20% of the oxygen-active sites can be blocked by CO. The iron atom in the heme group must initially be in the ferrous (Fe2+) oxidation state to support oxygen and other gases' binding and transport (it temporarily switches to ferric during the time oxygen is bound, as explained above). Initial oxidation to the ferric (Fe3+) state without oxygen converts hemoglobin into "hemiglobin" or methemoglobin, which cannot bind oxygen. Hemoglobin in normal red blood cells is protected by a reduction system to keep this from happening. Nitric oxide is capable of converting a small fraction of hemoglobin to methemoglobin in red blood cells. The latter reaction is a remnant activity of the more ancient nitric oxide dioxygenase function of globins. Hence, blood with high carbon dioxide levels is also lower in pH (more acidic). Hemoglobin can bind protons and carbon dioxide, which causes a conformational change in the protein and facilitates the release of oxygen. Protons bind at various places on the protein, while carbon dioxide binds at the α-amino group. Carbon dioxide binds to hemoglobin and forms carbaminohemoglobin. This decrease in hemoglobin's affinity for oxygen by the binding of carbon dioxide and acid is known as the Bohr effect. The Bohr effect favors the T state rather than the R state. (shifts the O2-saturation curve to the right). Conversely, when the carbon dioxide levels in the blood decrease (i.e., in the lung capillaries), carbon dioxide and protons are released from hemoglobin, increasing the oxygen affinity of the protein. A reduction in the total binding capacity of hemoglobin to oxygen (i.e. shifting the curve down, not just to the right) due to reduced pH is called the root effect. This is seen in bony fish. Hemoglobin also carries nitric oxide (NO) in the globin part of the molecule. This improves oxygen delivery in the periphery and contributes to the control of respiration. NO binds reversibly to a specific cysteine residue in globin; the binding depends on the state (R or T) of the hemoglobin. The resulting S-nitrosylated hemoglobin influences various NO-related activities such as the control of vascular resistance, blood pressure and respiration. NO is not released in the cytoplasm of red blood cells but transported out of them by an anion exchanger called AE1. Hemoglobin Hopkins-2 - A variant form of hemoglobin that is sometimes viewed in combination with Hemoglobin S to produce sickle cell disease. When red blood cells reach the end of their life due to aging or defects, they are removed from the circulation by the phagocytic activity of macrophages in the spleen or the liver or hemolyze within the circulation. Free hemoglobin is then cleared from the circulation via the hemoglobin transporter CD163, which is exclusively expressed on monocytes or macrophages. Within these cells the hemoglobin molecule is broken up, and the iron gets recycled. This process also produces one molecule of carbon monoxide for every molecule of heme degraded. Heme degradation is one of the few natural sources of carbon monoxide in the human body, and is responsible for the normal blood levels of carbon monoxide even in people breathing pure air. The other major final product of heme degradation is bilirubin. Increased levels of this chemical are detected in the blood if red blood cells are being destroyed more rapidly than usual. Improperly degraded hemoglobin protein or hemoglobin that has been released from the blood cells too rapidly can clog small blood vessels, especially the delicate blood filtering vessels of the kidneys, causing kidney damage. Iron is removed from heme and salvaged for later use, it is stored as hemosiderin or ferritin in tissues and transported in plasma by beta globulins as transferrins. When the porphyrin ring is broken up, the fragments are normally secreted as a yellow pigment called bilirubin, which is secreted into the intestines as bile. Intestines metabolise bilirubin into urobilinogen. Urobilinogen leaves the body in faeces, in a pigment called stercobilin. Globulin is metabolised into amino acids that are then released into circulation. To a small extent, hemoglobin A slowly combines with glucose at the terminal valine (an alpha aminoacid) of each β chain. The resulting molecule is often referred to as Hb A1c, a glycosylated hemoglobin. The binding of glucose to amino acids in the hemoglobin takes place spontaneously (without the help of an enzyme) in many proteins, and is not known to serve a useful purpose. However, as the concentration of glucose in the blood increases, the percentage of Hb A that turns into Hb A1c increases. In diabetics whose glucose usually runs high, the percent Hb A1c also runs high. Because of the slow rate of Hb A combination with glucose, the Hb A1c percentage reflects a weighted average of blood glucose levels over the lifetime of red cells, which is approximately 120 days. The levels of glycosylated hemoglobin are therefore measured in order to monitor the long-term control of the chronic disease of type 2 diabetes mellitus (T2DM). Poor control of T2DM results in high levels of glycosylated hemoglobin in the red blood cells. The normal reference range is approximately 4.0–5.9%. Though difficult to obtain, values less than 7% are recommended for people with T2DM. Levels greater than 9% are associated with poor control of the glycosylated hemoglobin, and levels greater than 12% are associated with very poor control. Diabetics who keep their glycosylated hemoglobin levels close to 7% have a much better chance of avoiding the complications that may accompany diabetes (than those whose levels are 8% or higher). In addition, increased glycosylation of hemoglobin increases its affinity for oxygen, therefore preventing its release at the tissue and inducing a level of hypoxia in extreme cases. Concentrations of oxy- and deoxyhemoglobin can be measured continuously, regionally and noninvasively using NIRS. NIRS can be used both on the head and on muscles. This technique is often used for research in e.g. elite sports training, ergonomics, rehabilitation, patient monitoring, neonatal research, functional brain monitoring, brain computer interface, urology (bladder contraction), neurology (Neurovascular coupling) and more. Hemoglobin can be tracked noninvasively, to build an individual data set tracking the hemoconcentration and hemodilution effects of daily activities for better understanding of sports performance and training. Athletes are often concerned about endurance and intensity of exercise. The sensor uses light-emitting diodes that emit red and infrared light through the tissue to a light detector, which then sends a signal to a processor to calculate the absorption of light by the hemoglobin protein. This sensor is similar to a pulse oximeter, which consists of a small sensing device that clips to the finger. ^ "Haemoglobin". Dictionary.com Unabridged. Random House. ^ Maton, Anthea; Jean Hopkins; Charles William McLaughlin; Susan Johnson; Maryanna Quon Warner; David LaHart; Jill D. Wright (1993). Human Biology and Health. Englewood Cliffs, New Jersey, US: Prentice Hall. ISBN 978-0139811760. ^ a b Sidell, Bruce; Kristin O'Brien (2006). "When bad things happen to good fish: the loss of hemoglobin and myoglobin expression in Antarctic icefishes". The Journal of Experimental Biology. 209 (Pt 10): 1791–802. doi:10.1242/jeb.02091. PMID 16651546. ^ Weed, Robert I.; Reed, Claude F.; Berg, George (1963). "Is hemoglobin an essential structural component of human erythrocyte membranes?". J Clin Invest. 42 (4): 581–88. doi:10.1172/JCI104747. PMC 289318. PMID 13999462. ^ Dominguez de Villota ED, Ruiz Carmona MT, Rubio JJ, de Andrés S (1981). "Equality of the in vivo and in vitro oxygen-binding capacity of haemoglobin in patients with severe respiratory disease". Br J Anaesth. 53 (12): 1325–28. doi:10.1093/bja/53.12.1325. PMID 7317251. ^ Costanzo, Linda S. (2007). Physiology. Hagerstwon, MD: Lippincott Williams & Wilkins. ISBN 978-0781773119. ^ Patton, Kevin T. (2015-02-10). Anatomy and Physiology. Elsevier Health Sciences. ISBN 9780323316873. ^ Epstein, F. H.; Hsia, C. C. W. (1998). "Respiratory Function of Hemoglobin". New England Journal of Medicine. 338 (4): 239–47. doi:10.1056/NEJM199801223380407. PMID 9435331. ^ Saha D, Reddy KV, et al. (2014). "Hemoglobin Expression in Nonerythroid Cells: Novel or Ubiquitous?". Int J Inflamm. 2014 (803237): 1–8. doi:10.1155/2014/803237. PMC 4241286. PMID 25431740. ^ a b c d e Biagioli M, Pinto M, Cesselli D, et al. (2009). "Unexpected expression of alpha- and beta-globin in mesencephalic dopaminergic neurons and glial cells". Proc. Natl. Acad. Sci. 106 (36): 15454–59. Bibcode:2009PNAS..10615454B. doi:10.1073/pnas.0813216106. PMC 2732704. PMID 19717439. ^ a b Weber RE, Vinogradov SN (2001). "Nonvertebrate hemoglobins: functions and molecular adaptations". Physiol. Rev. 81 (2): 569–628. doi:10.1152/physrev.2001.81.2.569. PMID 11274340. ^ Adair, Gilbert Smithson (1925). "A critical study of the direct method of measuring the osmotic pressure of hǣmoglobin". Proc. R. Soc. Lond. A 108 (750): 292–300. Bibcode:1925RSPSA.109..292A. doi:10.1098/rspa.1925.0126. ^ Hünefeld F.L. (1840). "Die Chemismus in der thierischen Organization". Leipzig. ^ Funke O (1851). "Über das milzvenenblut". Z Rat Med. 1: 172–218. ^ "A NASA Recipe For Protein Crystallography" (PDF). Educational Brief. National Aeronautics and Space Administration. Archived from the original (PDF) on 2008-04-10. Retrieved 2008-10-12. ^ Hoppe-Seyler F (1866). "Über die oxydation in lebendem blute". Med-chem Untersuch Lab. 1: 133–40. ^ a b Hardison, Ross C. (2012-12-01). "Evolution of hemoglobin and its genes". Cold Spring Harbor Perspectives in Medicine. 2 (12): a011627. doi:10.1101/cshperspect.a011627. ISSN 2157-1422. PMC 3543078. PMID 23209182. ^ Hardison, Ross C. (2012). "Evolution of Hemoglobin and Its Genes". Cold Spring Harbor Perspectives in Medicine. 2 (12): a011627. doi:10.1101/cshperspect.a011627. ISSN 2157-1422. PMC 3543078. PMID 23209182. ^ A Syllabus of Human Hemoglobin Variants (1996). Globin.cse.psu.edu. Retrieved 2013-09-05. ^ Hemoglobin Variants. Labtestsonline.org. Retrieved 2013-09-05. ^ Projecto-Garcia, Joana; Natarajan, Chandrasekhar; Moriyama, Hideaki; Weber, Roy E.; Fago, Angela; Cheviron, Zachary A.; Dudley, Robert; McGuire, Jimmy A.; Witt, Christopher C. (2013-12-17). "Repeated elevational transitions in hemoglobin function during the evolution of Andean hummingbirds". Proceedings of the National Academy of Sciences. 110 (51): 20669–74. Bibcode:2013PNAS..11020669P. doi:10.1073/pnas.1315456110. ISSN 0027-8424. PMC 3870697. PMID 24297909. ^ Beall, Cynthia M.; Song, Kijoung; Elston, Robert C.; Goldstein, Melvyn C. (2004-09-28). "Higher offspring survival among Tibetan women with high oxygen saturation genotypes residing at 4,000 m". Proceedings of the National Academy of Sciences of the United States of America. 101 (39): 14300–04. Bibcode:2004PNAS..10114300B. doi:10.1073/pnas.0405949101. ISSN 0027-8424. PMC 521103. PMID 15353580. ^ Burka, Edward (1969). "Characteristics of RNA degradation in the erythroid cell". The Journal of Clinical Investigation. 48 (7): 1266–72. doi:10.1172/jci106092. PMC 322349. PMID 5794250. Retrieved 8 October 2014. ^ Steinberg, MH (2001). Disorders of Hemoglobin: Genetics, Pathophysiology, and Clinical Management. Cambridge University Press. p. 95. ISBN 978-0521632669. ^ Hardison, RC (1996). "A brief history of hemoglobins: plant, animal, protist, and bacteria". Proc Natl Acad Sci USA. 93 (12): 5675–79. Bibcode:1996PNAS...93.5675H. doi:10.1073/pnas.93.12.5675. PMC 39118. PMID 8650150. ^ Linberg R, Conover CD, Shum KL, Shorr RG (1998). "Hemoglobin based oxygen carriers: how much methemoglobin is too much?". Artif Cells Blood Substit Immobil Biotechnol. 26 (2): 133–48. doi:10.3109/10731199809119772. PMID 9564432. ^ Hemoglobin. Worthington-biochem.com. Retrieved 2013-09-05. ^ Van Beekvelt MC, Colier WN, Wevers RA, Van Engelen BG (2001). "Performance of near-infrared spectroscopy in measuring local O2 consumption and blood flow in skeletal muscle". J Appl Physiol. 90 (2): 511–19. doi:10.1152/jappl.2001.90.2.511. PMID 11160049. ^ Ahrens; Kimberley, Basham (1993). Essentials of Oxygenation: Implication for Clinical Practice. Jones & Bartlett Learning. p. 194. ISBN 978-0867203325. ^ Ogawa, S; Menon, R. S.; Tank, D. W.; Kim, S. G.; Merkle, H; Ellermann, J. M.; Ugurbil, K (1993). "Functional brain mapping by blood oxygenation level-dependent contrast magnetic resonance imaging. A comparison of signal characteristics with a biophysical model". Biophysical Journal. 64 (3): 803–12. Bibcode:1993BpJ....64..803O. doi:10.1016/S0006-3495(93)81441-3. PMC 1262394. PMID 8386018. ^ a b Bren KL, Eisenberg R, Gray HB (2015). "Discovery of the magnetic behavior of hemoglobin: A beginning of bioinorganic chemistry". Proc Natl Acad Sci U S A. 112 (43): 13123–27. Bibcode:2015PNAS..11213123B. doi:10.1073/pnas.1515704112. PMC 4629386. PMID 26508205. ^ a b Goodman, Morris; Moore, G. William; Matsuda, Genji (1975-02-20). "Darwinian evolution in the genealogy of haemoglobin". Nature. 253 (5493): 603–08. Bibcode:1975Natur.253..603G. doi:10.1038/253603a0. PMID 1089897. ^ a b c Storz, Jay F.; Opazo, Juan C.; Hoffmann, Federico G. (2013-02-01). "Gene duplication, genome duplication, and the functional diversification of vertebrate globins". Molecular Phylogenetics and Evolution. 66 (2): 469–78. doi:10.1016/j.ympev.2012.07.013. ISSN 1095-9513. PMC 4306229. PMID 22846683. ^ Zimmer, E. A.; Martin, S. L.; Beverley, S. M.; Kan, Y. W.; Wilson, A. C. (1980-04-01). "Rapid duplication and loss of genes coding for the alpha chains of hemoglobin". Proceedings of the National Academy of Sciences of the United States of America. 77 (4): 2158–62. Bibcode:1980PNAS...77.2158Z. doi:10.1073/pnas.77.4.2158. ISSN 0027-8424. PMC 348671. PMID 6929543. ^ Pin S, Alpert B, Michalowicz A (1982). "Oxygen bonding in human hemoglobin and its isolated subunits: A XANES study". FEBS Lett. 147 (1): 106–10. doi:10.1016/0014-5793(82)81021-1. PMID 7140986. ^ Pin, S.; Valat, P.; Cortes, R.; Michalowicz, A.; Alpert, B. (1985). "Ligand binding processes in hemoglobin. Chemical reactivity of iron studied by XANES spectroscopy". Biophysical Journal. 48 (6): 997–1001. Bibcode:1985BpJ....48..997P. doi:10.1016/S0006-3495(85)83862-5. PMC 1329432. PMID 4092074. ^ Bianconi A, Congiu-Castellano A, Dell'Ariccia M, Giovannelli A, Burattini E, Durham PJ (1985). "Increase of the Fe effective charge in hemoproteins during oxygenation process". Biochemical and Biophysical Research Communications. 131 (1): 98–102. doi:10.1016/0006-291X(85)91775-9. PMID 4038310. ^ Childs PE (2001). "Haemoglobin – a molecular lung: 2". Chemistry in Action (65). ISSN 0332-2637. Archived from the original on 2009-01-16. ^ Chen H, Ikeda-Saito M, Shaik S (2008). "Nature of the Fe-O2 bonding in oxy-myoglobin: effect of the protein". Journal of the American Chemical Society. 130 (44): 14778–90. doi:10.1021/ja805434m. PMID 18847206. ^ Mihailescu, Mihaela-Rita; Russu, Irina M. (2001-03-27). "A signature of the T → R transition in human hemoglobin". Proceedings of the National Academy of Sciences of the United States of America. 98 (7): 3773–77. Bibcode:2001PNAS...98.3773M. doi:10.1073/pnas.071493598. ISSN 0027-8424. PMC 31128. PMID 11259676. ^ Chou KC (1989). "Low-frequency resonance and cooperativity of hemoglobin". Trends Biochem. Sci. 14 (6): 212–13. doi:10.1016/0968-0004(89)90026-1. PMID 2763333. ^ Jensen, Frank B (2009). "The dual roles of red blood cells in tissue oxygen delivery: oxygen carriers and regulators of local blood flow". Journal of Experimental Biology. 212 (Pt 21): 3387–93. doi:10.1242/jeb.023697. PMID 19837879. ^ Hall, John E. (2010). Guyton and Hall textbook of medical physiology (12th ed.). Philadelphia, Pa.: Saunders/Elsevier. p. 502. ISBN 9781416045748. ^ Nelson, D. L.; Cox, M. M. (2000). Lehninger Principles of Biochemistry, 3rd ed. New York, : Worth Publishers. p. 217, ISBN 1572599316. ^ Guyton, Arthur C.; John E. Hall (2006). Textbook of Medical Physiology (11 ed.). Philadelphia: Elsevier Saunders. p. 511. ISBN 978-0721602400. ^ Biochemistry (Eighth ed.). New York: W. H. Freeman. 2015-04-08. ISBN 9781464126109. ^ Rutjes, H. A.; Nieveen, M. C.; Weber, R. E.; Witte, F.; Van den Thillart, G. E. E. J. M. (20 June 2007). "Multiple strategies of Lake Victoria cichlids to cope with lifelong hypoxia include hemoglobin switching". AJP: Regulatory, Integrative and Comparative Physiology. 293 (3): R1376–83. doi:10.1152/ajpregu.00536.2006. PMID 17626121. ^ Gronenborn, Angela M.; Clore, G.Marius; Brunori, Maurizio; Giardina, Bruno; Falcioni, Giancarlo; Perutz, Max F. (1984). "Stereochemistry of ATP and GTP bound to fish haemoglobins". Journal of Molecular Biology. 178 (3): 731–42. doi:10.1016/0022-2836(84)90249-3. PMID 6492161. ^ Weber, Roy E.; Frank B. Jensen (1988). "Functional adaptations in hemoglobins from ectothermic vertebrates". Annual Review of Physiology. 50: 161–79. doi:10.1146/annurev.ph.50.030188.001113. PMID 3288089. ^ Rang, H.P. ; Dale M.M. ; Ritter J.M. ; Moore P.K. (2003). Pharmacology, Fifth Edition. Elsevier. ISBN 978-0443072024. ^ William, C. Wilson; Grande, Christopher M.; Hoyt, David B. (2007). "Pathophysiology of acute respiratory failure". Trauma, Volume II: Critical Care. Taylor & Francis. p. 430. ISBN 9781420016840. ^ McGaffigan, P. A. (1996). "Hazards of hypoxemia: How to protect your patient from low oxygen levels". Nursing. 26 (5): 41–46, quiz 46. doi:10.1097/00152193-199626050-00013. PMID 8710285. ^ Madsen, H; Ditzel, J (1984). "Blood-oxygen transport in first trimester of diabetic pregnancy". Acta Obstetricia et Gynecologica Scandinavica. 63 (4): 317–20. doi:10.3109/00016348409155523. PMID 6741458. ^ Padmanaban, P.; Toora, B. (2011). "Hemoglobin: Emerging marker in stable coronary artery disease". Chronicles of Young Scientists. 2 (2): 109. doi:10.4103/2229-5186.82971. 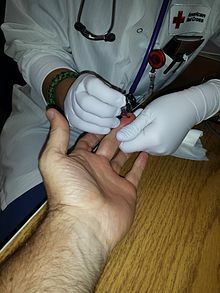 ^ Hemoglobin Level Test. Ibdcrohns.about.com (2013-08-16). Retrieved 2013-09-05. ^ Murray S.S. & McKinney E.S. (2006). Foundations of Maternal-Newborn Nursing. 4th ed., p. 919. Philadelphia: Saunders Elsevier. ISBN 1416001417. ^ Frasca, D.; Dahyot-Fizelier, C.; Catherine, K.; Levrat, Q.; Debaene, B.; Mimoz, O. (2011). "Accuracy of a continuous noninvasive hemoglobin monitor in intensive care unit patients*". Critical Care Medicine. 39 (10): 2277–82. doi:10.1097/CCM.0b013e3182227e2d. PMID 21666449. ^ Ferrari, M.; Binzoni, T.; Quaresima, V. (1997). "Oxidative metabolism in muscle". Philosophical Transactions of the Royal Society B: Biological Sciences. 352 (1354): 677–83. doi:10.1098/rstb.1997.0049. PMC 1691965. PMID 9232855. ^ Madsen, P. L.; Secher, N. H. (1999). "Near-infrared oximetry of the brain". Progress in Neurobiology. 58 (6): 541–60. doi:10.1016/S0301-0082(98)00093-8. PMID 10408656. ^ McCully, K. K.; Hamaoka, T. (2000). "Near-infrared spectroscopy: What can it tell us about oxygen saturation in skeletal muscle?". Exercise and Sport Sciences Reviews. 28 (3): 123–27. PMID 10916704. ^ Perrey, S. P. (2008). "Non-invasive NIR spectroscopy of human brain function during exercise". Methods. 45 (4): 289–99. doi:10.1016/j.ymeth.2008.04.005. PMID 18539160. ^ Rolfe, P. (2000). "Invivonear-Infraredspectroscopy". Annual Review of Biomedical Engineering. 2: 715–54. doi:10.1146/annurev.bioeng.2.1.715. PMID 11701529. ^ Mehagnoul-Schipper DJ, van der Kallen BF, Colier WN, van der Sluijs MC, van Erning LJ, Thijssen HO, Oeseburg B, Hoefnagels WH, Jansen RW (2002). "Simultaneous measurements of cerebral oxygenation changes during brain activation by near-infrared spectroscopy and functional magnetic resonance imaging in healthy young and elderly subjects". Hum Brain Mapp. 16 (1): 14–23. doi:10.1002/hbm.10026. PMID 11870923. ^ "Cercacor - How Ember's non-invasive hemoglobin technology works". Cercacor - How Ember's non-invasive hemoglobin technology works. Retrieved 2016-11-03. ^ L. Int Panis; B. Goddeeris; R Verheyen (1995). "The hemoglobin concentration of Chironomus cf.Plumosus L. (Diptera: Chironomidae) larvae from two lentic habitats". Netherlands Journal of Aquatic Ecology. 29 (1): 1–4. doi:10.1007/BF02061785. ^ Liu L, Zeng M, Stamler JS (1999). "Hemoglobin induction in mouse macrophages". Proceedings of the National Academy of Sciences of the United States of America. 96 (12): 6643–47. Bibcode:1999PNAS...96.6643L. doi:10.1073/pnas.96.12.6643. PMC 21968. PMID 10359765. ^ Newton DA, Rao KM, Dluhy RA, Baatz JE (2006). "Hemoglobin Is Expressed by Alveolar Epithelial Cells". Journal of Biological Chemistry. 281 (9): 5668–76. doi:10.1074/jbc.M509314200. PMID 16407281. ^ Nishi, H.; Inagi, R.; Kato, H.; Tanemoto, M.; Kojima, I.; Son, D.; Fujita, T.; Nangaku, M. (2008). "Hemoglobin is Expressed by Mesangial Cells and Reduces Oxidant Stress". Journal of the American Society of Nephrology. 19 (8): 1500–08. doi:10.1681/ASN.2007101085. PMC 2488266. PMID 18448584. ^ Boh, Larry (2001). Pharmacy Practice Manual: A Guide to the Clinical Experience. Lippincott Williams & Wilkins. ISBN 978-0781725415. ^ Holden, Constance (2005). "Blood and Steel". Science. 309 (5744): 2160. doi:10.1126/science.309.5744.2160d. ^ Moran L, Horton RA, Scrimgeour G, Perry M (2011). Principles of Biochemistry. Boston, MA: Pearson. p. 127. ISBN 978-0321707338. ^ Henry, Sean (August 7, 2014). "Take a sneak peek at the MUHC's art collection". CBC News. Retrieved February 1, 2016. ^ "Lustre (Hémoglobine) 2014". Art Public Montréal. Montréal. Retrieved February 1, 2016. Campbell, MK (1999). Biochemistry (third ed.). Harcourt. ISBN 978-0030244261. Ganong, WF (2003). Review of Medical Physiology (21st ed.). Lange. ISBN 978-0071402361. Hager, T (1995). Force of Nature: The Life of Linus Pauling. Simon and Schuster. ISBN 978-0684809090. Hardison, Ross C. (2012). "Evolution of Hemoglobin and Its Genes". Cold Spring Harbor Perspectives in Medicine. 2 (12): a011627. doi:10.1101/cshperspect.a011627. ISSN 2157-1422. PMC 3543078. PMID 23209182.